These are tough times for Nokia. Probably the toughest ones yet. At the same time, they are very exciting, because this is pushing the manufacturer to come up with its best smartphones yet. Powered by Microsoft's Windows Phone 8 OS, however, Nokia's new Lumia handsets aren't expected to make that much of a splash in today's industry landscape, which is densely populated by iPhones and all kinds of Android devices. Considering Windows Phone 8's unproven status, could it really be the tool that Nokia needs to regain its lost positions? In our opinion, this is still up in the air, because no one knows if there's going to be a sudden increase of WP8 device sales now that Microsoft has finally launched its Windows 8 OS. Love it or hate it, Nokia has bet the house on the Windows ecosystem, and the chances right now seem to be 50/50. 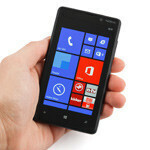 With all that in mind, we're quite excited to be reviewing the Nokia Lumia 820 – the mid-range model in the manufacturer's starting WP8 line-up. Almost as important as its beefier sibling, the Lumia 920, the 820 can give us a relatively good idea of where Nokia is going nowadays. Picking up the Lumia 820 for the first time, it immediately becomes obvious that this is 100% Nokia. What we mean is that the manufacturer is known for its extremely well-made phones that can withstand all kinds of harsh treatment, and this phone is definitely not an exception. Well, we can't guarantee that the screen won't break if you drop this device on something hard, but the Lumia 820 does feel very solid and well-built. The handset is not super-slim, though is still has an athletic profile, and it's also relatively heavy at 5.64oz (160g). To put this into perspective, the HTC Windows Phone 8X weighs 4.59oz (130g), and the Apple iPhone 5 weighs 3.95oz (112g). 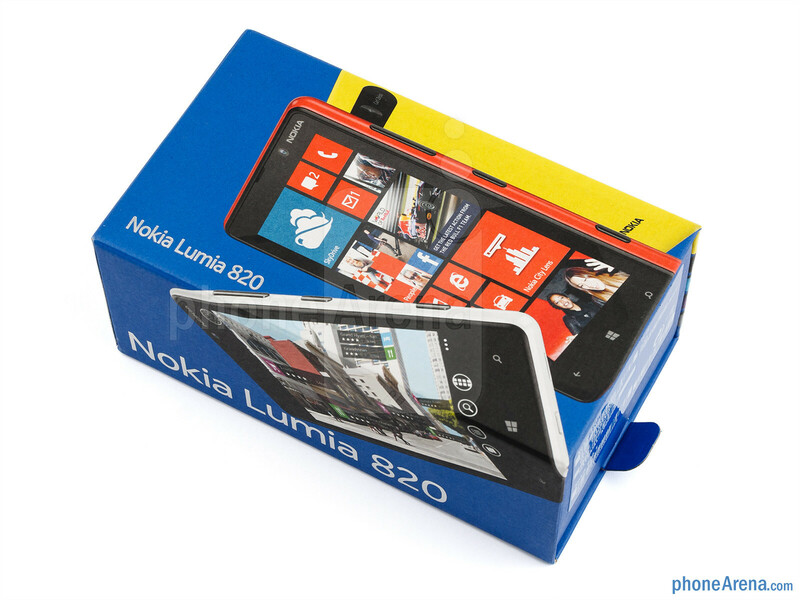 We thoroughly enjoy holding and using the Lumia 820. We can't say that it's as awesome as the aluminum casing of the iPhone 5, but it's better than the soft-touch coating of the Windows Phone 8X. The Lumia 820 is made of polycarbonate, so it's still just plastic, but it feels very well in the hand. 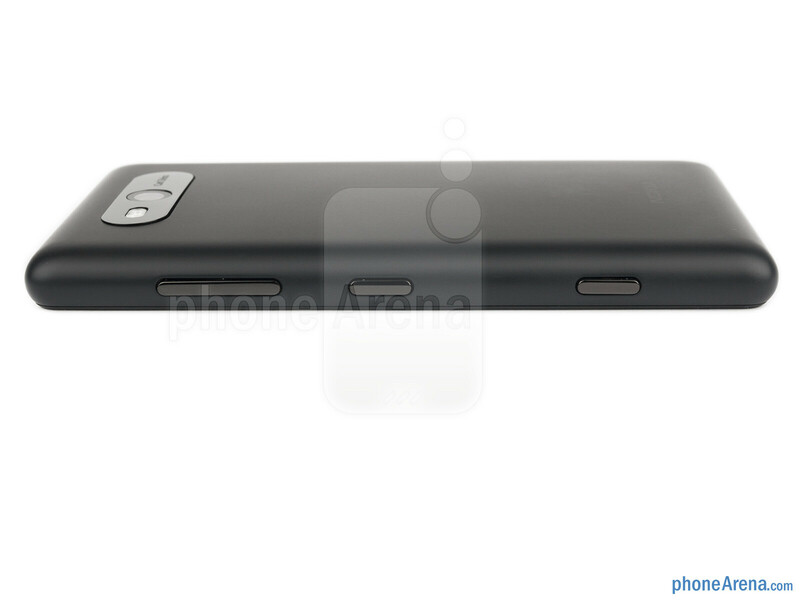 The handset is built like a tank, so to speak. 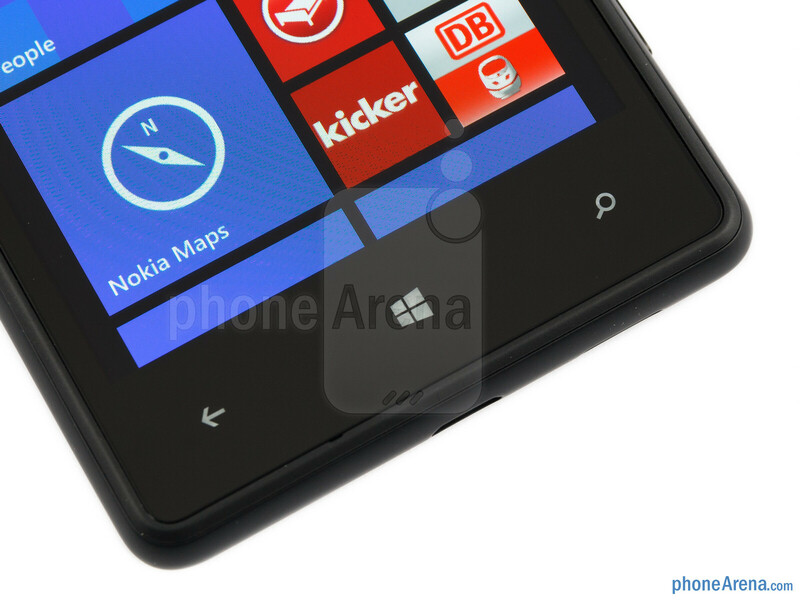 You can compare the Nokia Lumia 820 with many other phones using our Size Visualization Tool. Reaffirming our positive impressions are the physical keys situated on the right side of the device: the volume rocker, power/lock key and two-step camera shutter. All of them have a very good travel leave you with absolutely no hesitations as to whether or not you've pressed the key. The back side of the Lumia 820 is home to the 8MP Carl Zeiss camera with dual LED flash. Other than that, it's completely clean, save for the subtle Nokia logo at the bottom. Speaking of the logo, we really like how Nokia has aligned the front logo to the right, instead of positioning it in the center. It gives the phone a unique and recognizable look. We'd like to congratulate Nokia for building such a sturdy device. It's a breath of fresh air in these days of skinny and featherlight smartphones. 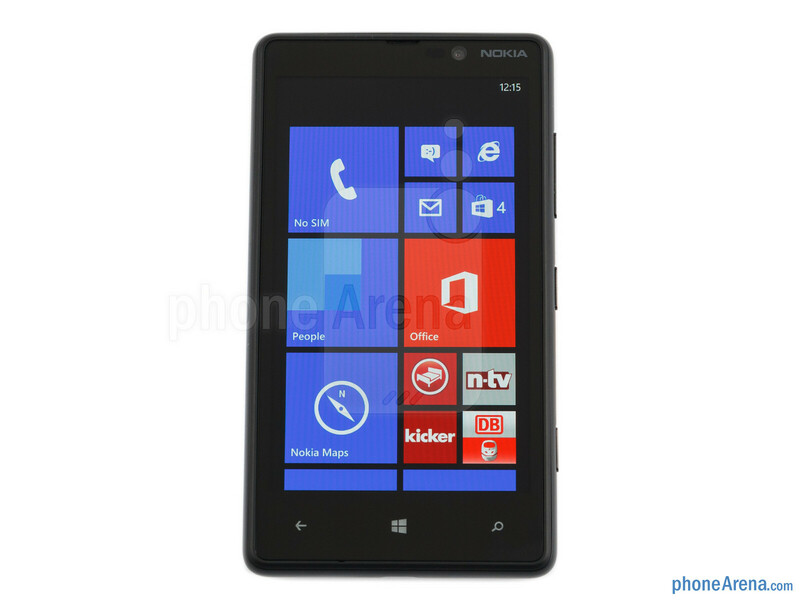 The Nokia Lumia 820 has an appealing and polished design that's pleasant to look at and hold. 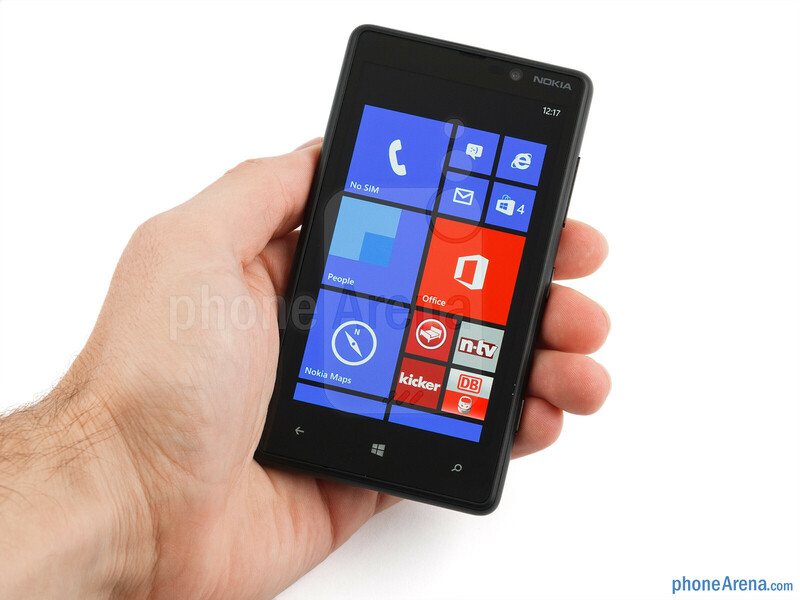 The Lumia 820 is armed with a 4.3” display with a resolution of 480 x 800 pixels. This translates into a pixel density of 217 ppi, which is far from today's “Retina” standards, but you shouldn't be worried about the screen's resolution. We can safely say that everything is still fine and easy to read. If you look closely, you'll be able to notice some fuzziness in the smaller text, but it's nothing distracting and can in no way ruin the experience. 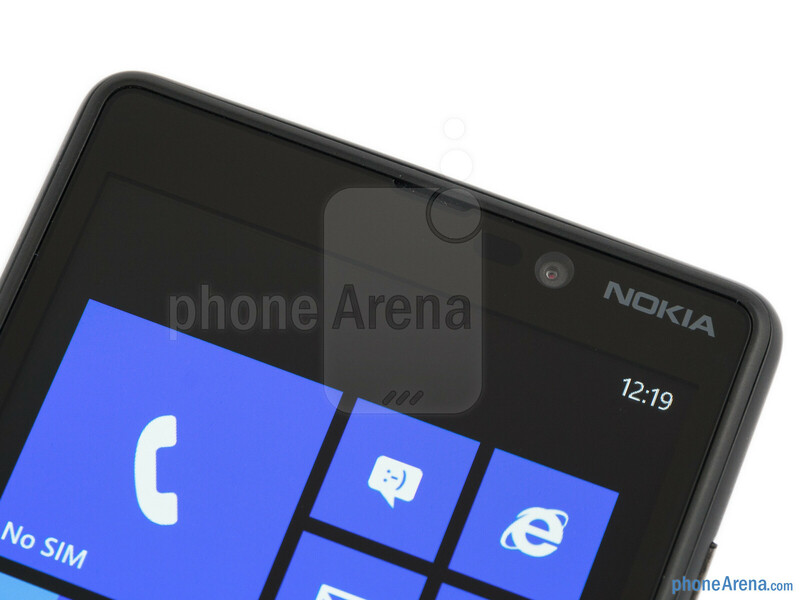 Nokia has used its ClearBlack AMOLED tech for the screen of the Lumia 820, and the result is quite pleasing. The display is very bright, brighter than most other AMOLEDs, and even the color temperature is decent. It's still an AMOLED screen, though, meaning that it gravitates towards the colder side, but is more accurate than what you'll get from a quality AMOLED screen like the one of the Galaxy S III, for example. An interesting feature of the Lumia 820's display is its ability to become super-sensitive. With this option activated, you can easily use your handset even when wearing gloves. We tested it and it works flawlessly. It is such kind of attention to detail that defines the quality of the user experience with a smartphone. 8 is quite fine i should say... Wasn't expecting Nokia to go bad on calling section...wonder what's going in their mind. Hope they fix it in the next roll out! It's an updated Lumia 900, which wasn't a bad phone by itself. I'll likely get one for my T-Mobile usage (since I'm using an unlocked 900 and only getting 2G on it), but only because the 920 isn't available through T-Mobile and an unlocked 920 is beyond what I want to spend for a phone right now, since I'll be getting a 920 for my AT&T services as well shortly. I wish they had increased the screen resolution just a bit, if only to 720. It looks good regardless, but it would be closer to the ATIV and WP8X/8S with a better screen. The camera I can live with, as the Nokia Camera Extras app alleviates many of the issues with the stock software. I'm a bit confused about the alleged call quality: the 900 has been nothing short of superb for the 7 months I've had it, and I see little reason why it would be lessened with the conversion to the 820. I must say, I'm pleasantly impressed that this is a Ray-written review. Kudos! Nokia should have done something better with the camera(knowing the pureview and 920) even though this is a mid-range device. I agree because if you can pick up the 920 on AT&T for $100 bucks on contract Then they should have gone pureview across all devices and the same screen resolution as the 920 also. Yeah but then all the phones would be thicker. It's good to have a bit of flexibility in the range in regards to styles, and it makes lower-cost models more approachable for a wider customer base. The 820 seems to take better photos than many mid-range smartphone cameras out there, and, price-wise, it even undercuts some of them. Folks will likely be cross-shopping other cheap smartphones like the Galaxy Exhilarate or the Pantech flavor-of-the-month, and while those are Android, the Nokia name and better camera may generate more sales. yes, me too! I think no any competitor company done well like Nokia for the WP8, even HTC trying to copy the design but the phone still looks ugly. 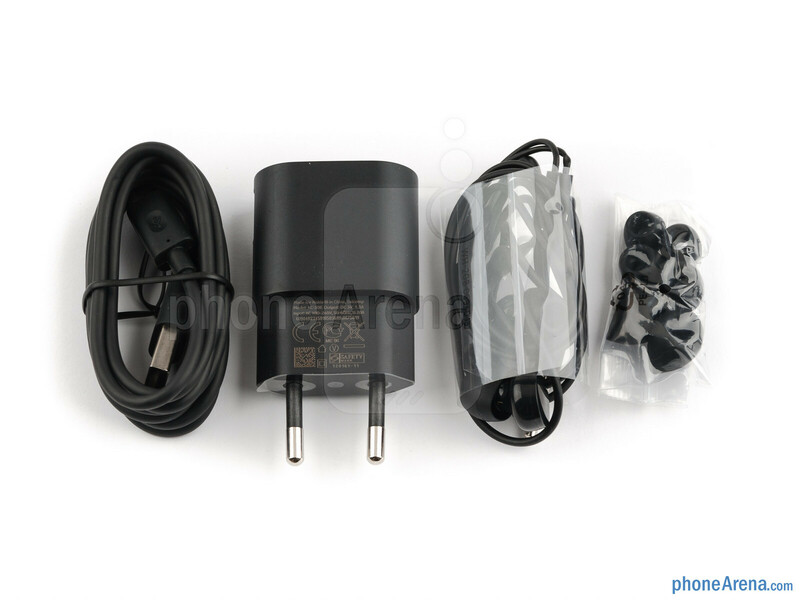 Nokia is the King of WP8 especially L920. Carl Zeiss optics and a weak camera? I'll believe it when I use it. Until then, that's a big question mark. Monitor in ear earphone for 820. no ear phone for 920. wow. The 920 isn't exclusive for AT&T, isn't it? So the international version should have earphones. 920 is way more expensive. International version unboxing videos of the 920 indicate some pretty nice earphones come with it. However, that's the same version that's $150 more than the AT&T version, albeit unlocked. I'd save the $150 and get some aftermarket ones or use the ones I already own. Not many on-contract phones in the U.S. come with earphones or headsets anymore in an attempt to cut costs, especially as most aren't used anyway. The iphone is the only one off the top of my head I can think of that does come with them, and they're not very good. As for Nokia Drive+ it's perfect that it's off line type. BIG PLUS for Nokia but you should mention as well other everyday use things that are not well made, ie: - you can't get map on and get directions by pointing on the map (need to know exact address to type), - can't save POI other than the one you're are in (or I couln't find it in L900) ; so first you need to travel there and than save POI, - once of about six/seven times it got me to the point that was not exactly what I wanted (last time happened in Poland when it took me to a desired street but the number was on the opposite side of A2 freeway), - if for instance you're in Shanghai and you type Sheraton (they have a few in Shanghai) the first one given was the closest one (if typed in English ; if typed in Chinese it moved to the middle of the list) the second one is UK's Hartlepool (9022km away) (OS is set to English for my convenience) ; had similar stupid results while in EU two month ago (out of the blue result that is on the other side of the globe), - and other one-language related issues. Google maps are the best as for now (no matter if you look for destination in English or Chinese or other language). Using the Local Search function in Bing or Nokia Maps instead of Nokia Drive can alleviate most of the issues you're describing, then just copy the address to Drive. I am a bit disappointed (Lumia 900 owner) that Maps isn't the same app for both driving and searching as it is on the Symbian Nokias, which makes things much easier to do. It isn't bad, and is still top-notch for what it does, it just lacks the integration I'm used to in the Symbian version. As for saving POIs, it should be saved in your search history on Drive, or you can add a POI as a favorite then delete it when done using it. The call quality scares me. 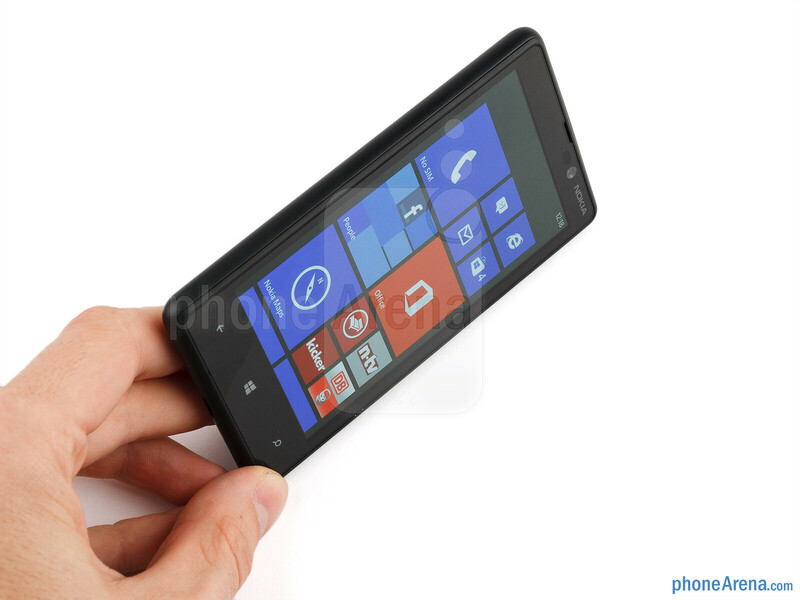 If I get a WP 8, it is out of pocket. Not paying for sub-par call quality. Luckily, even a sub-par Nokia camera will most likely be at least a slght step up from my Focus S, which is truly just fair. Wonder if I will see the High Df screens of the 920 and top end Android and just cross this off my list or if the screen will at least hold it's own. I'm guessing the call quality is a fluke. This is essentially a reskinned 900 with a MicroSD slot and improved guts. I've had a 900 for 7 months and the calling quality has been superb. I wish the loudspeaker were able to get louder, but otherwise it's been more than satisfactory. You do have a return period to try out the device, typically 14-30 days depending on place of purchase. That said, the 920 is $50 more, and with all its improvements is absolutely worth it. This is the only site i have read of the "bad" call quality. Although, a user in his review reported the same. I find it hard to believe that NOKIA does not give call quality to suich phones. Do you have any news? 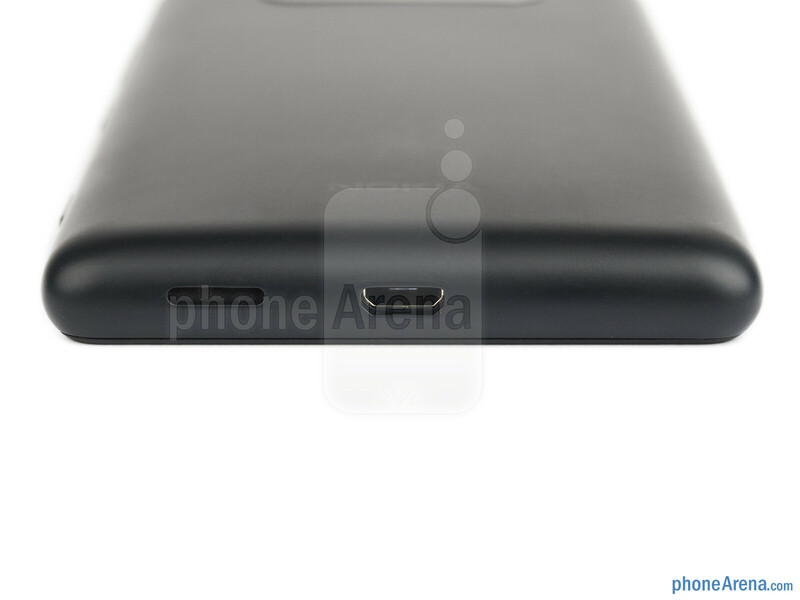 I like the phone case design of the Lumia 820 better than the Nokia Lumia 920 because it has rounded off edges. 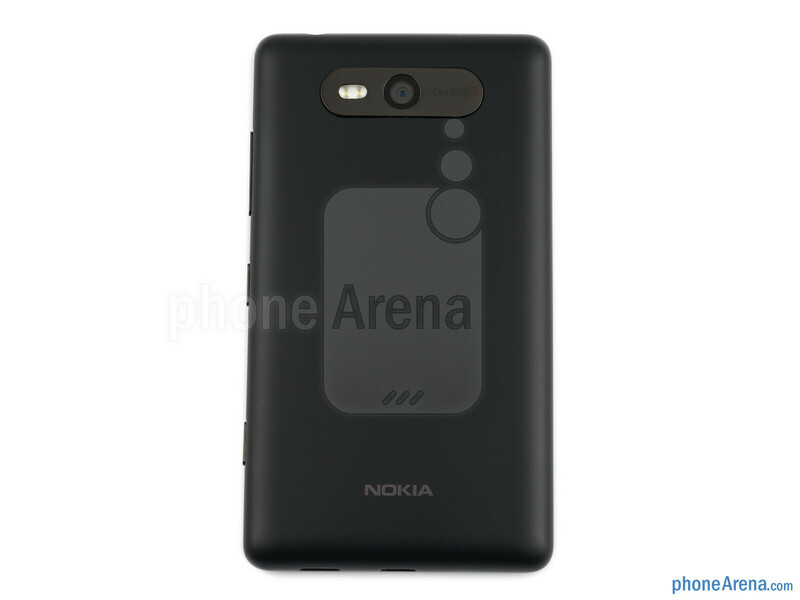 the Lumia 920 is too much a copy cat of the lumia 900 to me I am not saying it's a bad looking smart phones but sooner or later Nokia has to move away from that case design because people will get tired of it. nokia lumia 920 all the way!!! hey PA its not that bad! i think its the camera of N9 which isnt that bad! 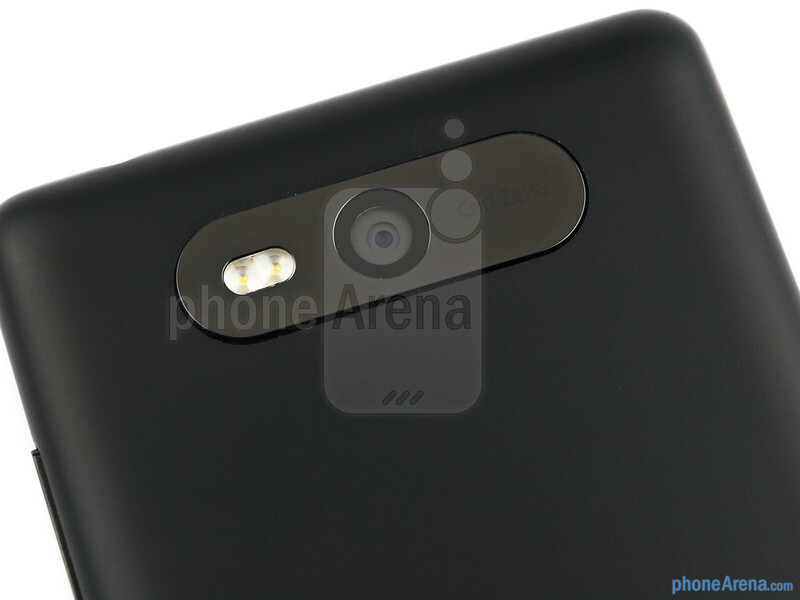 i wish nokia will bring N8's camera to lumia too! even though pureview is great! 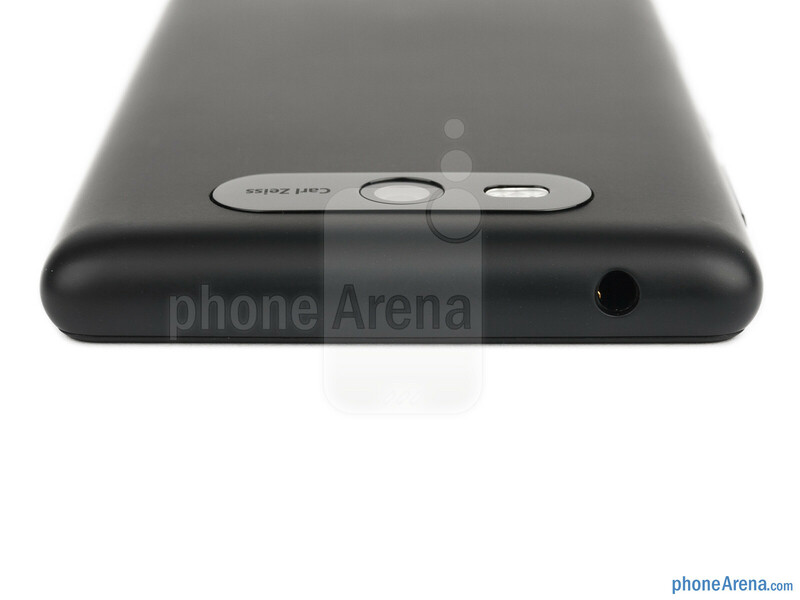 but hoping they'll power their mid-range or higher mid-range with N8's camera! Was gonna get this as my first smartphone, but the lack of flash worries me, and the call quality. This phone is quite ugly! Bulky, blank, bad camera, to many cons to even get a mid range phone like this. Screen PPI is horrible. What was nokia thinking? To all the haters, lumias look bad as it can ever be through photos. The story is very different in the real world. Take in hands any lumia and a galaxy. You'll feel it.